Solar Domestic Water Heating is a comprehensive introduction to all aspects of solar domestic water heating systems. As fossil fuel prices continue to rise and awareness of climate change grows, interest in domestic solar water heating is expanding. Solar water heating technology is the most environmentally-friendly way to heat water. This fully-illustrated and easy-to-follow guide shows how domestic solar water heating systems work, the different types of systems, types of collectors, both flat plate and evacuated tube, types of storage tanks and other accessories. It also shows how systems are installed and explains how solar water heating can be integrated into existing water heating systems. Numerous examples from around the world have been included. 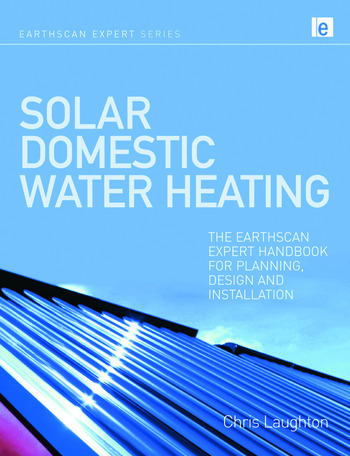 The ideal guide for plumbers, heating engineers, builders and architects, housing and property developers, home owners and DIY enthusiasts, and anyone who needs a clear introduction to solar water heating technology. Chris Laughton is Managing Director of The Solar Design Company. He is an experienced heating engineer, author and lecturer, and a regular columnist in magazines, journals and on-line media.